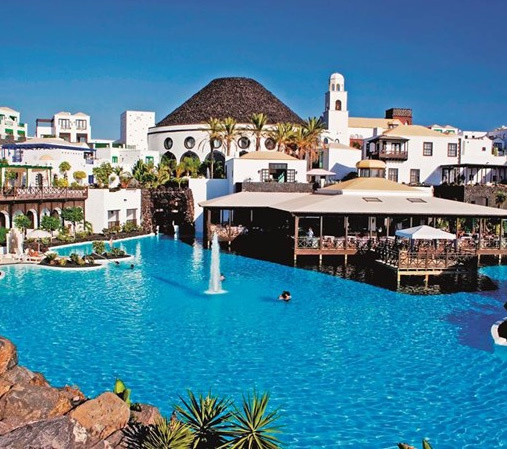 Lanzarote has several top class hotels and the 5 star Hotel Volcan Lanzarote is up there with the best of them! Its location is enviable, close to the sea and the modern yachting marina the Marina Rubicon, just 10 km from the Timanfaya National Park, 900 metres from the centre of the picturesque village of Playa Blanca and just 30 minutes from the International Airport of Arrecife. The hotel's stunning design is sympathetic to Canarian architecture with a luxury Lanzarote village style. From the first breath-taking impression to the last sad moment of farewell this hotel will remain a very long time in every visitors memory. 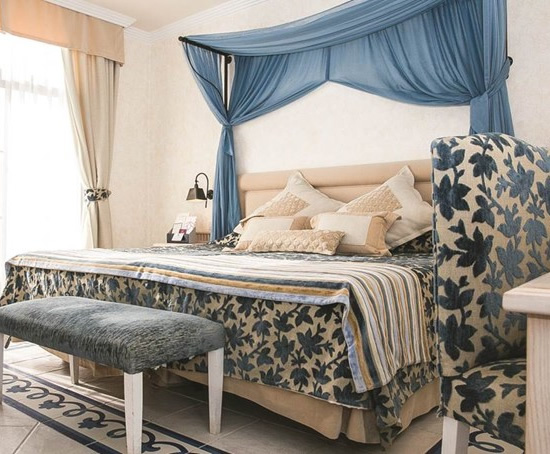 If you are looking for a luxury hotel in Playa Blanca with extensive facilities then look no further than this excellent 5 star luxury property. The rooms of the Hotel Volcan Lanzarote are distributed among 20 typical Canarian style 'houses'. There are 251 rooms in total (48 designated for 'Club Volcan' guests) which enjoy magnificent views of the Islands of Fuerteventura and Lobos, the Papagayo beaches, the Marina Rubicón yachting harbor, the village of Playa Blanca and the spectacular swimming pools and gardens of this superb hotel. 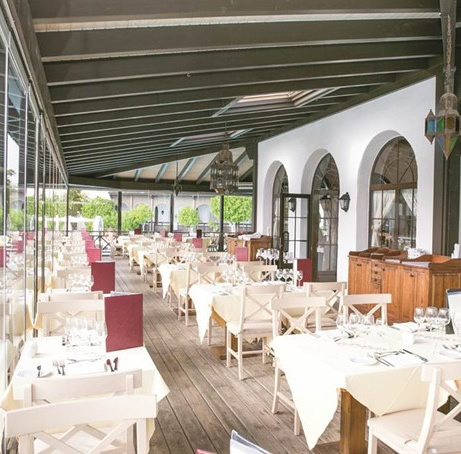 As you may imagine for a hotel of this quality the gastronomic options are superb, the Pier Buffet La Florida has magnificent views over the pool, open for breakfast, lunch and dinner with an extensive menu of Spanish and international dishes, theme buffets and show cooking. You can try the Kazan Japanese restaurant, Italian Restaurant and Gourmet Restaurant with international specialities. The El Islote poolside bar provides snack and tapas service. In the evenings you can relax in the Los Jameos disco-pub and enjoy live music and professional shows. The Hotel has its own adults only 'Fun Pub' showing live sports (dress code applies). If you would like to pamper yourself why not upgrade to the hotel's Club Volcan, here you can enjoy a host of exclusive amenities, these include; separate reception with private check-in, early check-in & late check-out subject to availability, personalized wake-up calls, welcome cocktail, refreshing towels, newspapers, courtesy room for late check-out. Club Volcan rooms have bathrobes and slippers, mineral water in room on arrival, tea and coffee facilities with free replacements, international and national daily newspapers, sheet and pillow menu, turn down service, room service from 08:00 to midnight, mini Hi-Fi system in room. Also to add to your holiday pleasure there is private breakfast buffet with option of breakfast in room free of charge (previously on request), exclusive bar service (drinks) with charge, aperitifs and fruits (free of charge), free courtesy bar available from 18:00 to 21:00 hrs, tea, coffee and cakes from 16:00 to 18:00 hrs (free of charge). 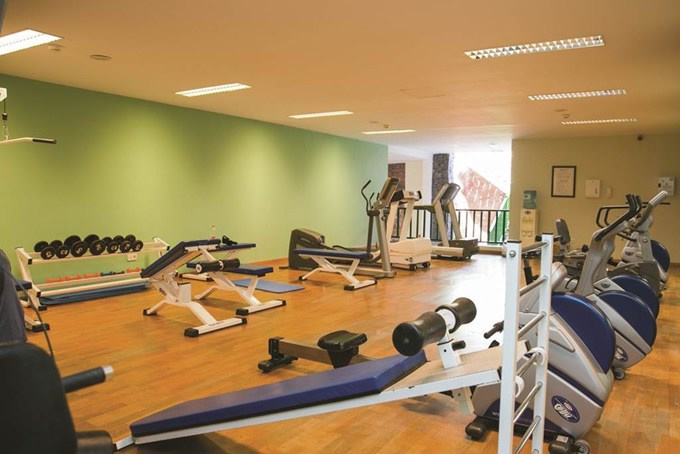 Guests can also enjoy a thermal circuit (sauna and Turkish bath) free of charge in the Wellness centre and have 10% discount off massages and other treatments, free gymnasium 24 hours per day and free squash court access. Other exclusive facilities include; exclusive heated pool (max. 24ºC) with pool bar. Solarium and private terrace with views over the islands of Los Lobos and Fuerteventura and the Natural Papagayo Beach, Jacuzzi on the pool terrace with spectacular views. Balinese sunbeds, free WIFI system in public areas, business center with free internet, private parking lot with direct access, reading room convertible into exclusive meeting room (capacity for 14 people), 10% discount in the hotel restaurants (drinks not included), courtesy beach bags in room, free tennis and paddle court in nearby Marina Rubicón and private solarium and terrace with sunbeds and direct access to the sea and Marina Rubicón.- Phew! you get the picture. Please ask us for a quote. Other facilities available from the hotel include; A well equipped gymnasium, Concierge service, 24-hour currency exchange, Beauty salon and hairdresser, Car hire, Bookings for day trips and excursions, outdoor car park and garage, shopping gallery with 2 boutiques and a gift shop, laundry service, internet corner, courier, fax, photocopies, etc. Babysitting and medical services on request.